The authors found that urinary cortisol levels were higher in all males during unstable compared to stable dominance periods, whereas aggression rates showed the reversed pattern, with higher rates in stable periods. In contrast to a previous study in another chimpanzee population, dominance rank and urinary cortisol levels were not associated in either period. These findings indicate that status maintenance is not associated with elevated physiological stress for dominant Taï male chimpanzees, and suggest that status competition and the uncertainty of dominance relationships within the group exposes all males to psychosocial stress, despite lower rates of aggressive interactions. This supports a number of other studies showing that unpredictability in social relationships is particularly stressful in primates, - including in humans. "Our study shows that open aggression was not the source of the high stress levels of males during periods of heightened male-male competition, but that males were affected by the social uncertainty induced by these competitive periods," says Preis. "We investigated two contexts that induce social instability, competition over status and competition over mating opportunities. For both contexts we found the same pattern: All males, irrespective of dominance rank, had higher stress levels during periods with high male-male competition, while aggression rates and intensities were higher in periods with low male-male competition." "One of our main findings is that male chimpanzees adjust competitive behaviors to context dependent conditions. When the risk of escalation was high, males avoided aggressive behaviors to diminish the risk of injury," says Roman Wittig, senior author of the study. "Chimpanzees are highly territorial and cooperatively defend their territories against intruders. 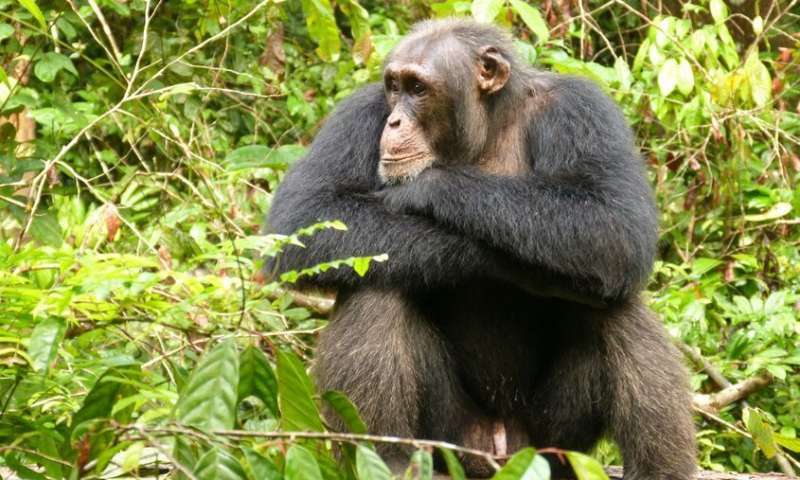 Male chimpanzees might therefore avoid aggressive behavior when dominance relationship are unclear and unstable, as part of a conflict management strategy that allows them to cooperate as a group during such periods." Conflict management strategies are crucial for the maintenance of stable life in social groups. The study illustrates that wild chimpanzees' contrast personal with group-level costs of aggression to manage their in-group conflicts.